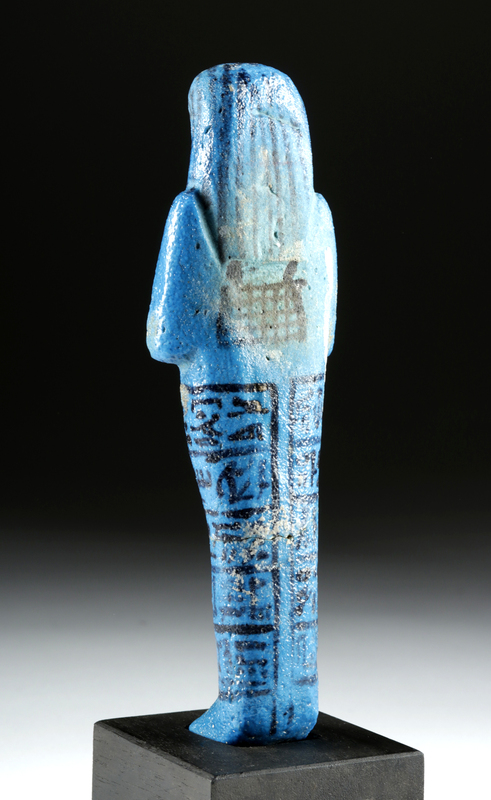 Ancient Egypt, Third Intermediate Period, 21st Dynasty, ca. 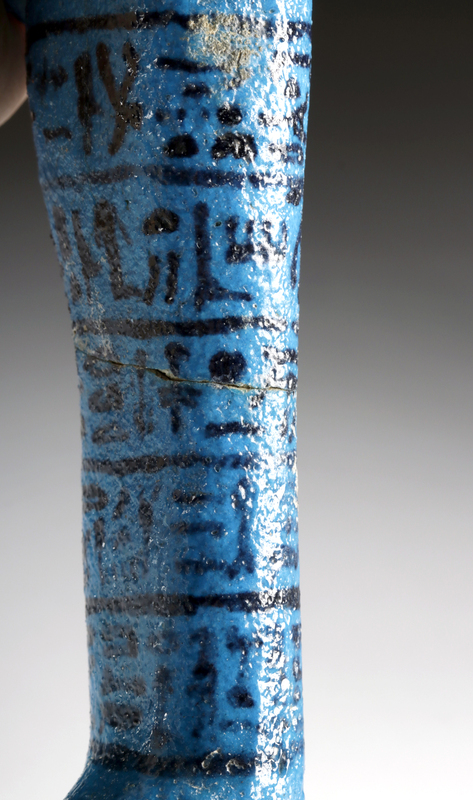 1069 to 945 BCE. 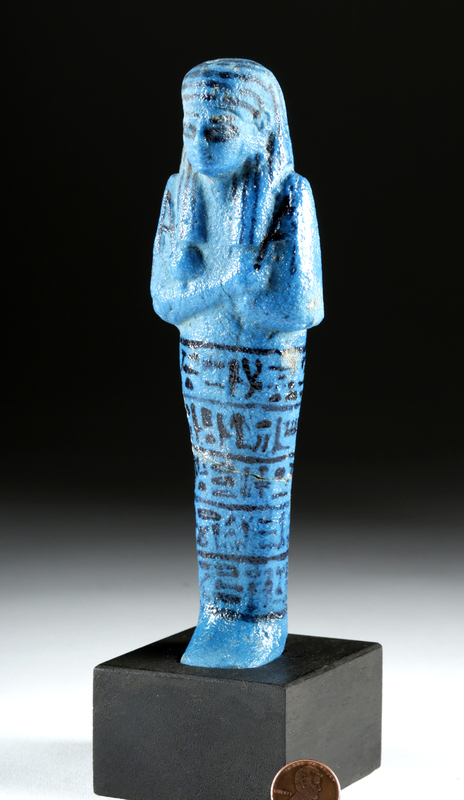 A stunning mold-formed faience ushabti enveloped in a brilliant cornflower-blue glaze with additional aesthetic details presented in applied black pigment. 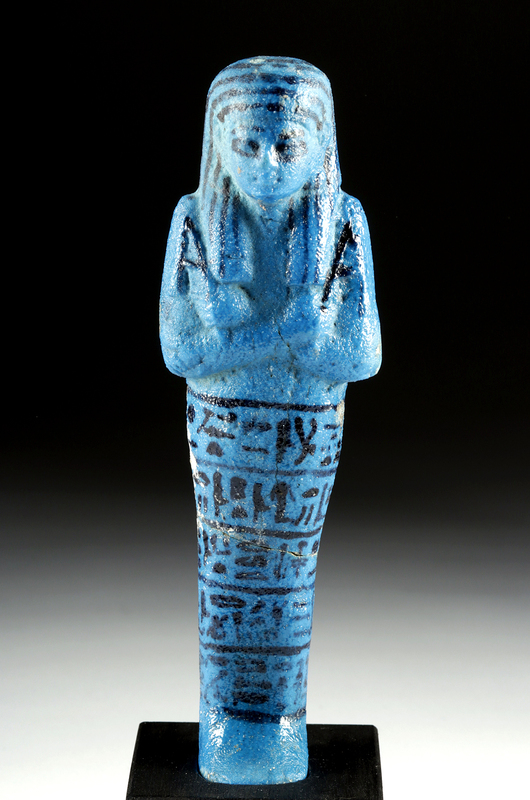 The figure stands in mummiform atop fused legs, with crossed arms pressed tightly against the chest, hands holding the symbolic pick and hoe, and a large seed bag painted across the back. A tripartite wig with painted vertical striations covers the head while a modeled nose, pursed lips, a petite chin, and painted eyes constitute the serene countenance. 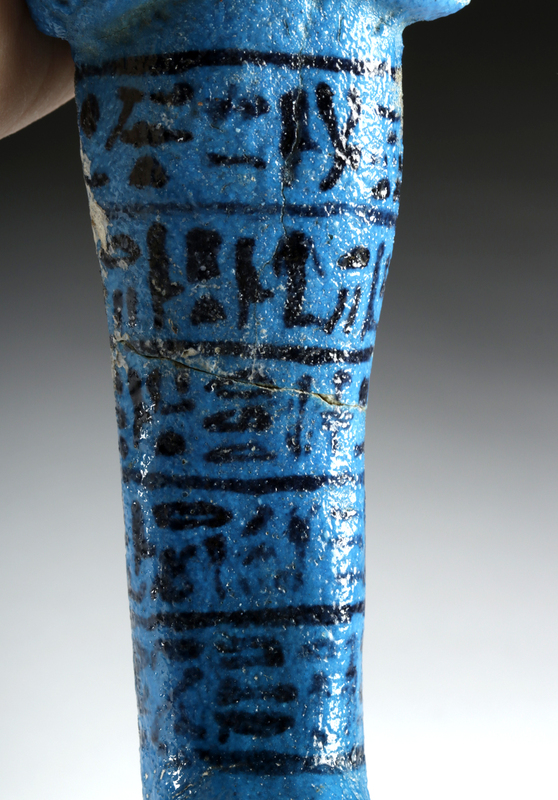 Five registers of hieroglyphic inscription that wrap around the lower body identify this figure as Princess Nesykhonsu (also Nesikhonsu, Nesi-Khonsu), chief of the harem of Amun, and provide her with blessings for her journey into the afterlife. Size: 2.125" W x 6.75" H (5.4 cm x 17.1 cm); 8.125" H (20.6 cm) on included custom stand. 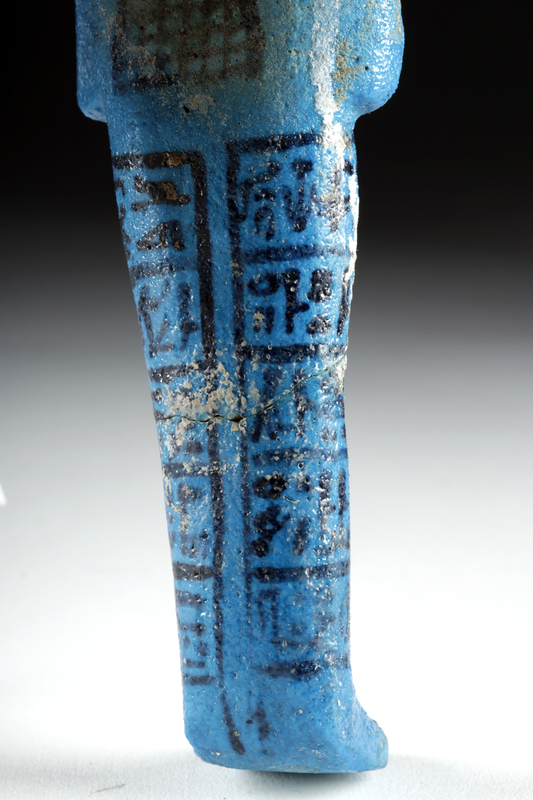 The tomb of Nesykhonsu is located in the mortuary complex at Deir el-Bahri (also Dayr el-Bahari, Arabic for "The Northern Monastery") in Thebes, Egypt in Tomb DB320 with her paternal uncle and husband, High Priest Pinedjem II. 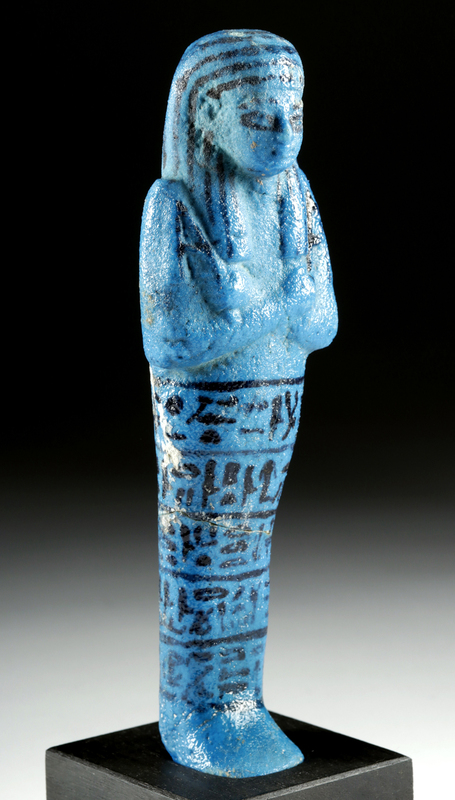 When translated, the inscription on this ushabti reads, "The Osiris, first chief of the concubines of Amun, Nesykhonsu, justified, he says: O these ushabtis, if counted upon, the Osiris, first chief of the concubines of Amun, Nesykhonsu, justified, to do all the works that are to be done there in the realm of the dead - now indeed obstacles are implanted there - as a man at his duties, 'here I am!' you shall say when you are counted upon at any time to serve there, to cultivate the fields, to irrigate the river banks, to ferry the sand of the west to the east and vice-versa, 'here I am' you shall say." 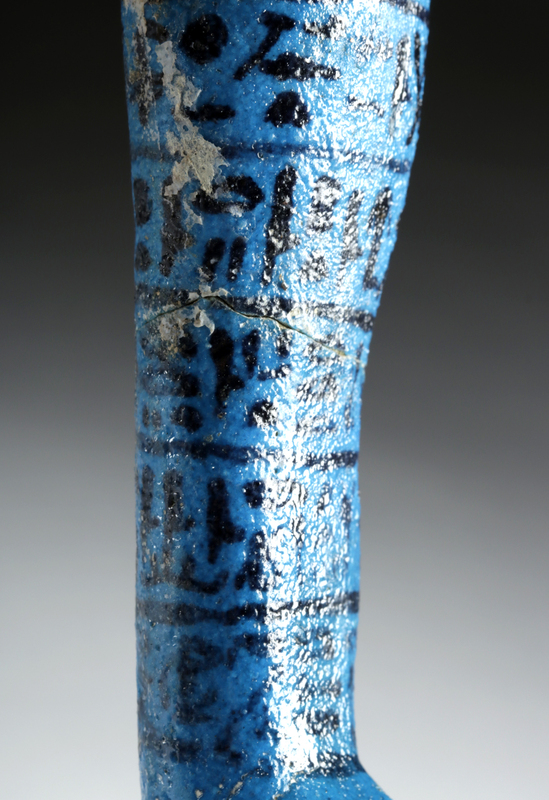 This piece has been tested using thermoluminescence (TL) analysis and has been found to be ancient and of the period stated. A full report will accompany purchase. Condition: Professionally repaired from multiple pieces with small chips and light adhesive residue along break lines. 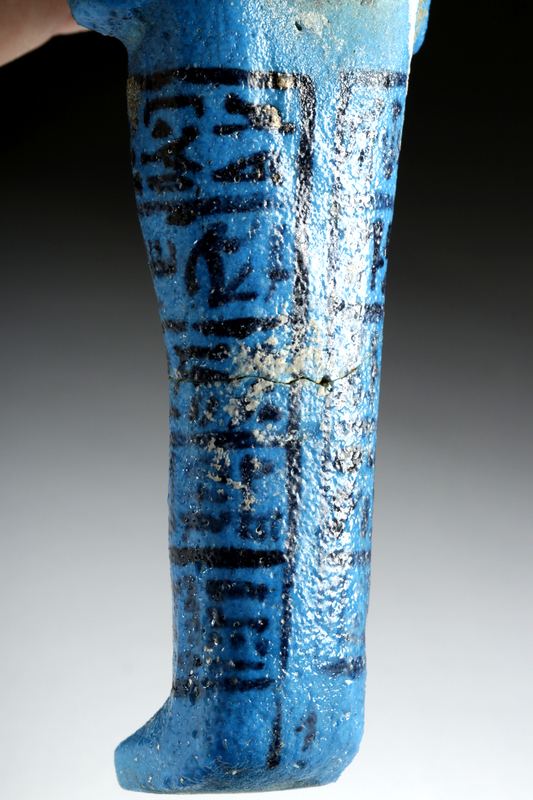 Small nicks to feet, legs, body, and head, one indentation to back of head, with fading to original blue and black pigmentation, and light encrustations. Light earthen deposits as well as fabulous traces of original pigmentation throughout.